One of the key findings of The Numbers Game: Why Everything You Know About Soccer Is Wrong is that soccer, more than any other team sport, is a weak link game: matches are won and lost, and championships and relegation are secured, by the genius and quality of a club's superstars, but even more so by the leaden boots, muddled minds, bad days, and miscommunications of the lesser lights. Bayern Munich is ascendant over Barcelona (for now) not because Ribéry and Schweinsteiger are better than Messi (they're not), but because the tail end of the Bavarians' roster is so strong and their coordination on the pitch is so seamless. The fact that soccer is a weak link game should guide what a club does on the pitch and in training. In the book, we outline five general tactics a manager has for addressing the problem of his weak links. Here, in this excerpt, we discuss one plan—improving the "incompetent" by getting him to work harder—and show that there is some actual science to team chemistry. In addition to inspiring speeches, kicks to the seat of the pants and punishing drills, the smart manager, often unwittingly, will use the Köhler effect to increase the effort of his weak links. This phenomenon is named for Wolfgang Köhler, head of the Psychological Institute of Berlin University in the 1920s. Köhler is an inspirational figure: he had built quite a team, a galácticos of modern psychology, but saw them disbanded when the Nazis rose to power in 1933. Many of those he worked with left Germany for America, while his Jewish colleagues were stripped of their positions. Köhler, though, did not suffer in silence. In April 1933 he wrote the last German newspaper article to criticize the Nazis until Hitler's death twelve years later, and subsequently he greeted the mandatory introduction of the Nazi salute at the start of lectures by telling his students – some of whom, no doubt, were party loyalists – that he "did not share the ideology which it usually signifies or used to signify." Given his work, it should be no surprise that Köhler possessed the willpower to stand tall out of loyalty to his scattered and suffering former colleagues. Through a very simple series of tests performed on members of the Berlin rowing club, Köhler had demonstrated that teamwork could produce significant gains in motivation. First, he tested how long each standing rower could, while holding and curling a bar connected to a weight of about 90 pounds, keep the weight from touching the floor. Then he doubled the weight, paired the rowers and tested how long they could curl the heavier bar together. This is a weak-link task because the weight was too great for any single person to hold up: the 180 pounds would hit the floor when the weaker partner's biceps gave out. Köhler found that weaker rowers would endure significantly longer when they were paired than when they were solo. In doing so he had isolated one of the key characteristics of psychology: the gain in enthusiasm and effort and perseverance that comes from being on a team. It was not until the 1990s that psychologists began to investigate the reasons behind Köhler's findings. They found two causes for the effect: a social comparison process, where individuals perform better when working with a more capable partner, and an "indispensability" condition in which individuals do not want to hold back the group and feel that their contribution is crucial to collective performance. Or, to put it more bluntly, the Köhler effect occurs because weak links work harder to keep up, whether in an attempt to match their more talented colleagues or because they think their role is just as essential. These two factors are equally important in helping improve a weak link. There is plenty of evidence that this applies to the world of sport. Take Jason Lezak, the final swimmer in the American 4 × 100 freestyle relay at the 2008 Olympics. Lezak was not the strongest swimmer in the team—despite being in probably the most crucial spot—and found himself up against Alain Bernard, anchor of the French team and the 100-meter freestyle world record holder. Worse still, when Lezak's leg started, he was a full body length behind. No matter. Lezak swam the fastest 100-meter relay split in world history, in 46.06 seconds, securing the gold for the United States. His split was faster than Bernard's by 0.67 seconds, and he out-touched the Frenchman by 0.08 seconds, an eye blink. The reason Lezak, who had won just two individual medals in major competitions, gave for his superhuman performance? "I'm part of a team, and today was no different. I got with the guys and said, 'We're not a 4-by-100 team. We're all one.'" Lezak's not the only swimmer to display the Köhler effect. A recent study of all the relay teams from the Beijing Olympics provides dramatic confirmation of its existence. Those athletes who swam the second and third legs beat their individual times by 0.4 per cent on average, and those who swam the anchor legs, the most indispensable, beat their solo times by 0.8 per cent, both significant margins in a sport decided in blinks of an eye. Köhler's weightlifting rowers did discover a very real phenomenon that can affect all teams, in business and in sports, including, of course, soccer. That's not to say that harnessing the Köhler effect is easy. It would mean a manager convincing a player earning millions, with a sycophantic agent and surrounded by an admiring entourage, that he is the worst player in the squad. That would be an interesting conversation, though it is not an impossible one. An adroit manager would, perhaps, be able to foist blame on a recent injury, a tough run of opposition, or his own failings as a boss to ease the player's dissatisfaction. Then the manager has to make the unfortunate player believe he can improve, and show him a path and a training program that seem promising. In addition, the manager has to promote the philosophy within the club that soccer is a weakest-link game and that, therefore, everyone's contributions are essential. This may be easier in some teams, such as military special forces units, where differences among teammates in compensation and recognition aren't dramatic, than in modern soccer. While the game says that everyone is essential, the salaries say that some are "more essential" than others. Crucially, the manager has to be blessed with a team-minded strongest link, the sort who is first to the training ground in the morning and last to leave at night, promoting an ethos of maximum effort at the same time as making it easier to think that his success is down to hard work, not sheer talent. This is better in terms of motivating the weak link, who can match the strong link's effort, if not his virtuosity. There are countless examples of strong links who do not fit this mold. Allen Iverson, the basketball superstar, held a famous press conference mocking the idea of practice and calling it "silly." Paul McGrath, while at Aston Villa, or Ledley King at Tottenham were not nearly so cocksure, but the need to manage injury prevented them joining in training sessions during the week. There are countless Brazilian strikers—Adriano, Edmundo—who regularly chose not to train, relying instead on their inherent ability. The effect on players without their talent would have been profound: work all you like, you'll never be in my class. Not good for the team. One superstar who does fit the mold is, no surprise, Lionel Messi. He's never viewed training as silly or unimportant. He wouldn't be caught dead repeating Iverson's scornful words at a press conference: "We're sittin' here, and I'm supposed to be the franchise player, and we're talkin' about practice." Messi's teammate Gerard Piqué observes, "He could say, 'OK , I'm the best, but in training I don't care, I can be lazy,' but he's working at the same level in training as well. It's unbelievable." 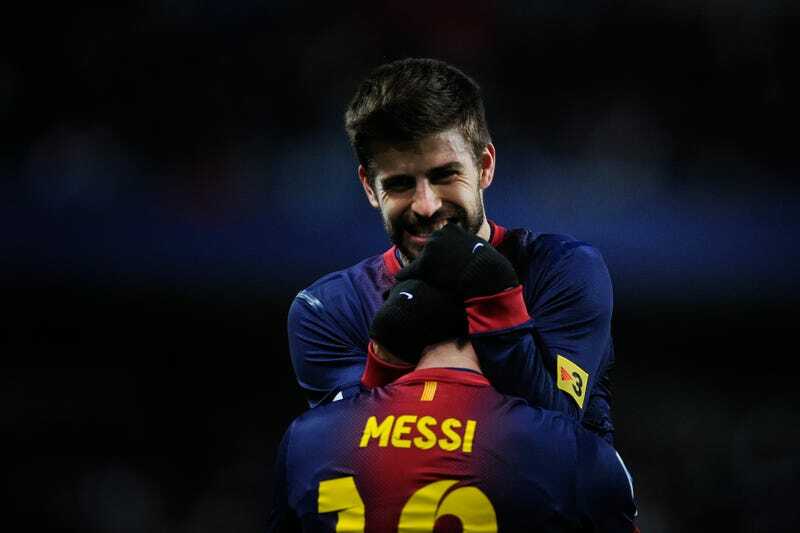 Surely, Piqué, very far from being a weak link, nonetheless goes a little harder in practice than he otherwise would. From The Numbers Game: Why Everything You Know About Soccer Is Wrong by Chris Anderson and David Sally. Reprinted by arrangement with Penguin Books, a member of Penguin Group (USA) LLC, A Penguin Random House Company. Copyright © Chris Anderson and David Sally, 2013.